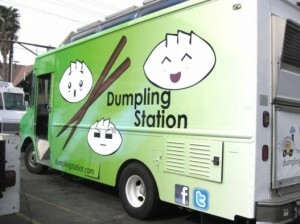 Dumpling Station – Los Angeles, CA (@dumplingstation) – Food Truck Talk – Searching for the best foodtrucks! 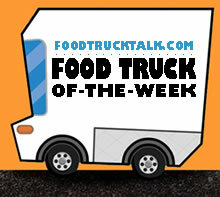 Congratulations to Dumpling Station as FoodTruckTalk.com’s Food Truck Of-The-Week! Note: This food truck is not currently operational. Asian dumplings and pot stickers are one of those food groups that are constantly debated. Who has the best potsticker, who has the best dipping sauce, how was the dough? It’s a fun debate since virtually everyone loves dumplings! While the soup dumpling is not on the menu of Helen Pan and Chris Aragan’s Dumpling Station they do offer up a great variety of dumplings! Each day they serve up five varieties of dumplings that you can order either steamed or fried ala pot stickers. Each order contains 8 dumplings. The Kimchi Pork and Kimchi Beef obviously are packed with flavor with a Korean slant. 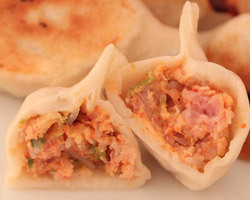 The Pork and Baby Leek dumplings are juicy and flavorful with the leek creating a Chinese texture and taste. For non-meaters the Veggie dumplings contain fresh cabbage, shredded carrots, bean sprouts and glass noodles. The Dumpling Station also offers up two unique side dishes. The Garlic Wasabi Fries kick up the flavor over regular french fries. The Cream Cheese and Jalapeno Wontons are spicy and silky inside a cruncy wonton shell. Definitely a clash of cultures!